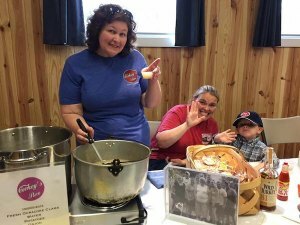 Mandi Cochran (OCC Board president), Jenny Mason, and Dallas Mason with their award-winning clam chowder at the 2016 contest. Chefs and foodies and cooks of all ages! 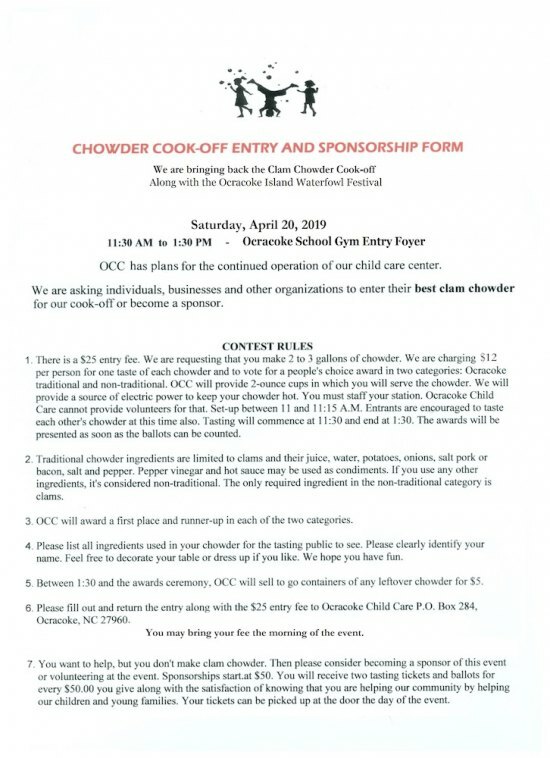 You're invited to enter the Ocracoke Child Care Clam Chowder Cook-Off on Saturday, April 20, 2019. This fundraising event will take place at Ocracoke School, adjacent to the 2nd annual Ocracoke Waterfowl Festival, which is free to attend. You can enter your amazing chowder in either the Traditional or Non-Traditional categories depending on what ingredients you use. (See below for official contest rules and entry forms.) (Entry forms are available at the Post Office.) It costs $25 to enter. Don't cook? Come out and try the chowders and vote for your favorite! Tasting tickets are just $12! Tasting starts at 11:30am and ends at 1pm. The winners will be announced as soon as the votes are tallied. Don't eat chowder? (Why not?) The Waterfowl Festival volunteers will be offering fish sandwiches, beverages, and baked goods, too! 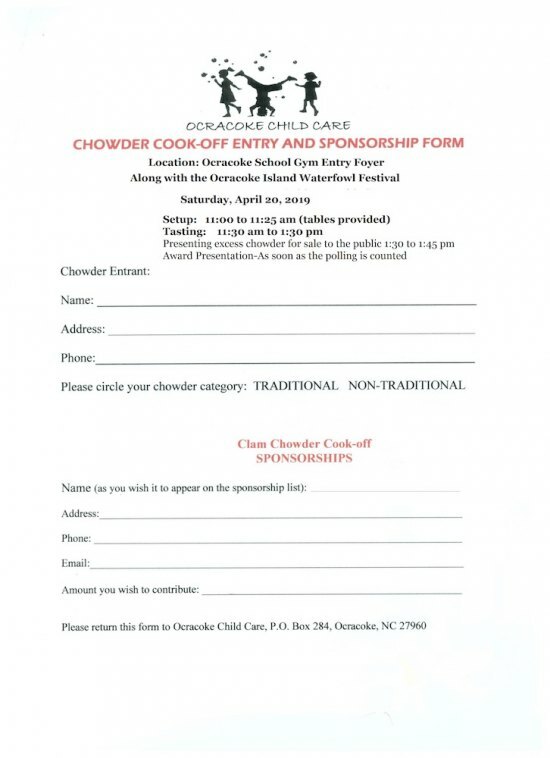 If you want to show your support for Ocracoke Child Care's efforts to re-open this year, please consider becoming a Clam Chowder Cook-Off sponsor! Sponsorships are $50 and include two tasting tickets. The Traditional category is ingredient-specific. 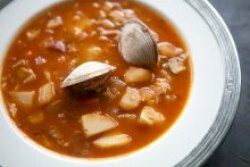 You can use an combination of the following: clams and their juice, water, potatoes, onions, salt pork or bacon, salt and pepper. 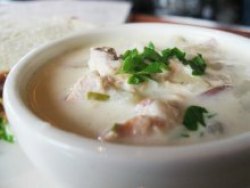 That's all the old-timers needed to make delicious Ocracoke clam chowder, and if it was good enough for them, it should be good enough for you, too. You're also permitted to provide pepper vinegar and/or hot sauce as condiments in the Traditional category. Your chowder is Non-Traditional if it contains any ingredient not listed above. It can have anything else in it as longs as clams are included. 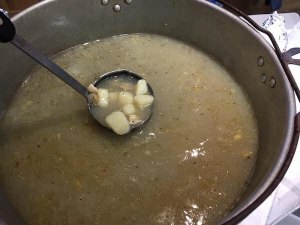 Traditional cooks might try the recipe for Clinton Gaskill’s famous, crowd-pleasing chowder, found in the island cookbook, Hoi Toiders, published in 1993 to benefit the Ocracoke Volunteer Fire Department. Fry out salt pork until it is cracklins. Steam the clams open and save the juice. Wash sand from clams and chop. Cook the clams in their juice for twenty minutes. Add cut up potatoes and onions. Mandi and Jenny served up traditional chowder made by Jenny's dad, Charles Mason. How will you choose between Traditional and Non-Traditional? Does your chowder look like this? Then it's Non-Traditional. The possibilities are endless for the Non-Traditional Clam Chowder Cook-Off entry. Surprise us!